Are you an elite gamer? The Xbox One X is designed for the ultimate gamers and takes a regular game to the next level with its spectacular features. Often described as a PC in a console, the new Xbox One console has 40% more power than any other console in the market. It is compatible with Xbox One games and accessories so you won’t have to worry about purchasing new games. The real highlight of this new console is that it offers a truly immersive experience in 4K, taking any video game and making it come to life right in front of you. Not only are the graphics simply stunning, but the new features help this console run faster and smoother than ever before. As well as all the wonderful enhanced features, the Xbox One X also facilitates Xbox Live which gives you even more ways to play your games. It’s faster and has better graphics than ever before. With 6 teraflops of graphical power, 40% more power and 12GB GDDR5 graphics memory, the Xbox One X is built for the ultimate gamers. Buy your immersive gaming experience today. Ultimate gamers, this one is for you. The Xbox One X is an incredibly powerful console, in fact, it has 40% more power than any other console in the market. Click a few buttons and watch your games come to life with the incredible graphics and quick loading times. From the moment you load up your games on the Xbox One X, you’ll be immersed in the gaming world in a whole new way. The Xbox One X has 40% more power than any other console in the market. Any gamer would take pride in playing their favourite first-person shooter or completing a quest on this console. The fast-er processor means your worlds and missions will load faster than ever. Bring real-world detail to your games with the Xbox One X.
Gaming should always be an immersive experience, and every quest, mission or adventure can be exactly that. Indulge in the Xbox One X and put yourself in the players' shoes as the console fea-tures 4K Ultra HD. Alongside HDR, spatial audio and 4K Game DVR, take your video games to the next level. Games such as Sea of Thieves, State of Decay 2 and Forza Motorsport 7 are best played in 4K, so get the most out of your games with the Xbox One X.
Don’t fret about buying lots of new gaming accessories and video games for the Xbox One X, be-cause this powerful console is backward compatible. But what does this mean? You can use your video games, accessories and your profile from Xbox One and Xbox 360 on your Xbox One X. Enjoy multiple generations of games on just the one device. You can even play selected Original Xbox games! 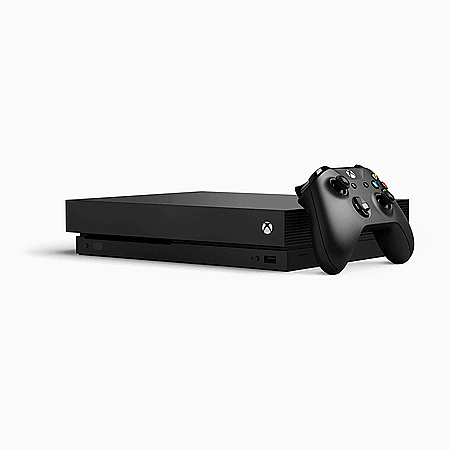 Xbox One X FAQs Can I play Xbox One and Xbox 360 games on this console? Using Microsoft’s backwards compatibility tool you can play existing and new Xbox 360 and Xbox One games on the new Xbox One X. This is completely free if you already own the games, however if you do not own Xbox Gold and want to play your friends at the old-school games then you will have to pay for membership. Has the Blu-ray drive been upgraded? Families can also enjoy the new Xbox One X with its Ultra HD 4K ready Blu-ray player. This of-fers you around 8.3 million pixels which is four times what you get in full HD/1080p. Unfortu-nately, normal HD discs will not play on the 4K updated Blu-ray drive. You also have the ability to stream 4k films and programmes straight from your new Xbox one X. How big is the Xbox One X? The Xbox One X is much smaller than the original Xbox One and of a similar size to the Xbox One S. Full dimensions are (H)59.95mm x (W)239.77mm x (D)299.97mm. The console weighs just under 4kg, clocking the scales at 3.81kg. Will the Xbox One X support virtual reality gameplay? Yes. The Xbox One X will have VR abilities, though it will not have it's own virtual reality headset like the PS4 Pro. This means it will rely on third-party support like the Oculus headset. Will the Xbox One X have a replaceable hard drive? Unfortunately, there will be no replaceable hard drive with the new Xbox One X and we wouldn’t recommend opening the internal component of the console as this will invalidate your warranty. 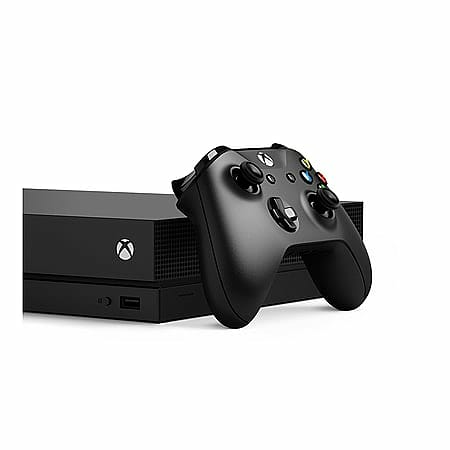 If you think you will go over the incredible 1TB of internal storage, then you can purchase an external hard drive which allows you to use one of the new three USB ports to connect it to your Xbox. 4K streaming with select apps, see Xbox.com. Some apps require app provider-specific subscriptions and/or other requirements. Broadband internet required (ISP fees apply). Xbox One Backward Compatibility feature works with select Xbox 360 games, see http://www.xbox.com/backcompat. Xbox Live and broadband internet required for initial download of game to console. Online multiplayer requires Xbox Live Gold (sold separately). Active Gold membership required to play free games. Restrictions apply. In some regions, the games must be messaged as “bonus” games instead of “free” games. Check with your CELA contact for approvals. Games sold separately. Forza Motorsport 7, Crackdown 3 and Sea of Thieves are coming soon. HDR functionality available with supported games and TVs Limited number of games available in 2017 support cross-device play; additional games to follow. Please Note: This product is available only to customers located in the United Kingdom.